Do you think high-school can sometimes be a burdensome experience for teenagers? Try adding Lyme into the mix. Recently, we had the pleasure of hearing from Christina Womble, a Lyme Warrior from Connecticut who has been suffering from an undiagnosed case of this disease for more than a decade, and yet was only accurately diagnosed last year! Does this sound familiar? 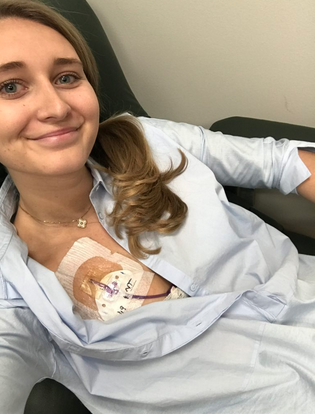 Christina has shared part of her unedited story with us and given us some insights about what is was like to battle Lyme at a very young age and how it affected her high-school experience and athletic opportunities in particular. “I have been suffering from an undiagnosed case of Chronic Lyme Disease for 11 years. I never had a bullseye rash and my major symptoms lay dormant until I was 15, a sophomore in high school. In the Spring of 2016, I was finally formally diagnosed with Lyme Disease. In my hometown, Greenwich, CT, it is commonly diagnosed by a bullseye rash and treated with 28 days of antibiotics. I was one of those kids who just got sick easily. I had a difficult case of ongoing sinusitis, a few more fevers than other kids, and recurring ear infections, but that was the extent of any symptoms I can recall from growing up. The doctors did not put these symptoms together as a cause for alarm. At the time, I can only remember having one tick bite. I was playing in my neighbor’s backyard when my mom noticed the small black tick under my arm. I screamed as she removed it from my skin. We knew the protocol, look for the bullseye rash and flu-like symptoms. But my test came back negative. I never got a rash. I never got sick. My first major ongoing symptoms that I experienced were stress fractures. I had played on a tennis team in Europe for 3 weeks and had what I was told were shin splints. When I returned home, trying to go for a run made me cry – an MRI diagnosed multiple stress fractures in my left leg. My sophomore year, I had been recruited to play tennis at Hotchkiss, a boarding school in CT. Ultimately, I never stepped foot on the court. I tried to rest, rehabilitate, and start training again. But every time I thought I was healed enough to start running or playing tennis, a few days later I was back at the hospital for special surgery getting another scan for whichever leg I had stressed this time. These recurring fractures became an endless cycle that foreshadowed the rest of my life. The fevers started the winter of my sophomore year. They came almost every few days. I would end up in the infirmary on average a day or two a week, out of school. I was weak and getting weaker. By spring, I was so sick that I spent entire weeks in the infirmary at a time. In April, after three weeks in the infirmary and a consistent fever of 103º, my mom picked me up and took me home. I took my finals at my old high-school, Greenwich Academy, and never returned to Hotchkiss. Although I tested negative for Mononucleosis twice, my doctor finally diagnosed me with mono. I was sick for the next 8 months. I went to prom and fell asleep on my date. I slept over 15 hours a day. Once the mono should have been gone, everyone thought I was depressed, though I continuously told them I wasn’t. I am the oldest of 5 kids and I care for younger siblings as if they’re my own. I am also type A and am prone to excessive worrying and stress. I was sent to therapy and put on antidepressants. Junior year was also when I began noticing trouble neurologically. In preschool, my dream was to become an NFL player or an FBI agent. My dad was an agent and someone I looked up to a lot growing up. I didn’t need attention meds because if I told myself it was time to sit down and focus, I would. In my junior year, that didn’t seem to be working anymore. Looking back I now know that I’d been experiencing this since 9th grade or before, but it worsened. With detailed notes, organized binders, and color-coded study guides, I would go into tests knowing that I had studied the topic, but not knowing exactly what I studied. My retention was becoming a problem as I studied for hours on end and received average grades. My therapist prescribed me Adderall, but after my experience with antidepressants both my mom and I were hesitant to use them, so I didn’t. Finally, thinking that I had nothing but a couple of stress fractures right before my first day of senior year, I was back to working out 2 hours a day, sometimes twice a day, running and lifting”. Christina was soon accepted at The University of Texas at Austin. Thinking she was good to go, she went on to travel by herself to Austin to start her college experience, while her body was still fighting Lyme disease. Many Lyme Disease symptoms exacerbate due to patients receiving late diagnoses and deferring treatment. Raising awareness helps to decrease the odds of this happening. 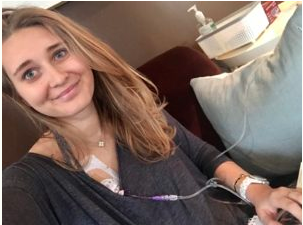 Striving to raise awareness, Christina and her mom Astrid started a personal blog called LymeLight: “An unedited account of battling the tickborn disease from a mother-daughter, nurse-patient, and best friend team”. You can learn more about Christina and Astrid’s experience with Lyme here!